HP is a company that is no stranger to making headlines: in 2016, it sent waves across the 3D printing industry with the launch of its Multi Jet Fusion technology. 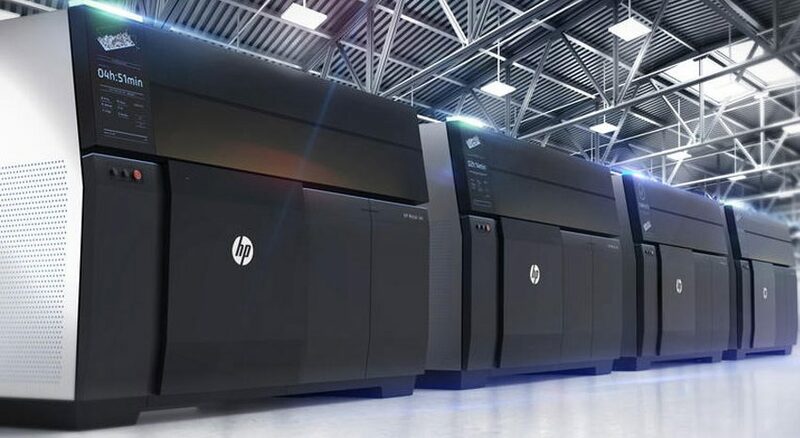 Marking HP’s first foray into additive manufacturing, the new technology promised new possibilities for the production of industrial-grade functional polymer parts and prototypes on a commercial scale. Now, two years later, HP has launched its latest offering: HP Metal Jet, its new 3D printing technology for the high volume manufacturing of production-grade metal parts. 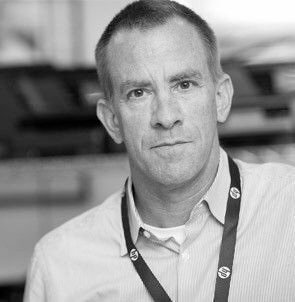 AMFG recently spoke with HP’s Global Head of Metals, 3D Printing Business, Dr. Tim Weber, to discover more about the company’s move towards metals and the wider implications of HP Metal Jet for end-part production. HP’s vision is to disrupt the manufacturing sector through its 3D printing technologies and this includes the metal manufacturing sector. However, while HP Metal Jet forms part of this vision, there are challenges that first need to be overcome. Weber identifies 3 areas that HP is committed to addressing. Weber also points to challenges related to materials: “Material price is another crucial factor: the materials are very costly and manufacturing is all about cost. If you have a production method that provides a way to produce parts at a lower cost, most manufacturers will make the switch right away. But we need to make sure that the overall material costs are reduced. Before delving into Metal Jet, first it’s worth taking a look at HP’s journey towards additive manufacturing, which began with its Multi Jet Fusion technology. 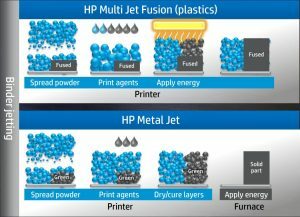 HP Multi Jet Fusion uses a binder jetting process, whereby plastic powder is spread across the bed. A fusing agent, engineered to absorb infrared energy, is jetted across an area of the part that needs to be solidified using HP’s PageWide technology. The infrared energy is absorbed by the material, melting the plastics and slowly building up the part. To date, the portfolio of the HP Multi Jet Fusion printers includes the 4200 and 4210, and the company has announced a smaller, integrated version of this system, the HP Jet Fusion 500/300 series, that can print in colour. Notably, Weber reports that one customer, Forecast 3D in the U.S., is currently producing parts into the millions, and now has 24 printers in place, running 24/7. HP’s Multi Jet Fusion technology has provided the perfect launch pad for Metal Jet. However, the move toward metal 3D printing is not without its own challenges. The binder jetting technology builds on the Multi Jet Fusion process and uses metal injection moulding (MIM) powders. Notably, Metal Jet is said to be up to 50 times more productive than comparable binder and laser sintering technologies on the market today, and is capable of producing isotropic parts that meet ASTM standards. 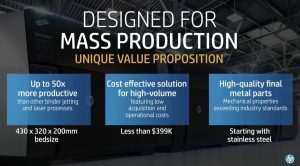 Weber believes HP’s proprietary technology, which leverages both printing and binder, will be the key to unlocking a sustainable value proposition for metal additive manufacturing. Alongside the launch, HP also announced several strategic partnerships, with the aim of fully unlocking the potential of the HP Metal Jet for functional metal parts. One of the partners is GKN Powder Metallurgy, a large manufacturer of metal parts that produces around 13 million parts per day. The partnership has already led to several key industrial clients, including Wilo, a leading pump manufacturer and Volkswagen. HP and Volkswagen are implementing a multi-year plan to integrate Metal Jet into their manufacturing strategy. The collaboration between Volkswagen, GKN Powder Metallurgy and HP has resulted in the ability to move quickly to assess the manufacturing of mass-customizable parts such as individualized key rings and exterior-mounted nameplates. Volkswagen’s multi-year plan to use HP Metal Jet also includes the production of higher performance functional parts with significant structural requirements, such as gearshift knobs and mirror mounts. As new platforms such as electric vehicles enter mass production, HP Metal Jet is expected to be leveraged for additional applications such as the lightweighting of fully safety-certified metal parts. The second notable partnership is Parmatech, which boasts 40 years of metal injection moulding experience. Primarily servicing the medical industry, the partnership offers a unique opportunity for HP to penetrate the sector. HP plans to use its production service to target key industries, which include automotive, medical and industrial sectors. With HP entering the metal AM market, how does Weber see additive manufacturing evolving over the next 5 years? “I think it’s a really exciting time for the industry. 3D printing has been focused on prototyping and speciality production of plastics and metals for such a long time, but now we’ve reached a point where we’re starting to see faster adoption of the technology. This will only continue as we begin the switch from prototyping to manufacturing. The HP Metal Jet Production Service, where customers can upload, test, and qualify designs for mass production, and begin receiving parts, goes live in early 2019. 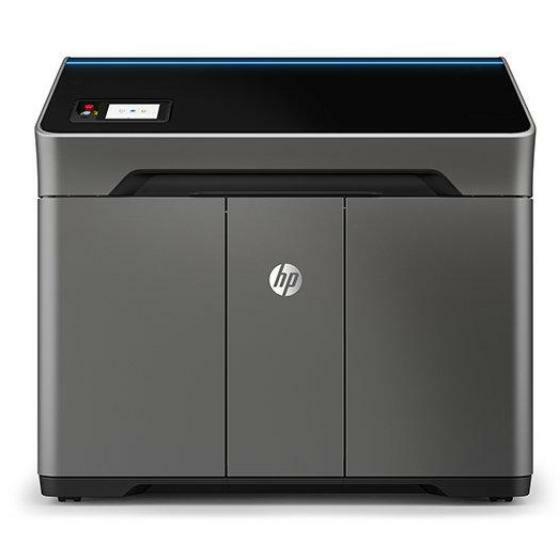 HP Metal Jet commercial systems are set for general release in 2020, with a price point of less than $399,000.